This feisty group of veteran Art Bra Models got the idea at last year’s show to each design their own art bra inspired by their favorite superhero. Valerie, a Runway Model last year, and Olivia and Christin, both Floor Models last year, describe the energy they experienced at Art Bra Austin as magical. “When you go through breast cancer,” says Valerie, “it can be very hard to always feel like the beautiful, strong woman that everyone tells you that you are. At Art Bra Austin, you finally feel like that strong, beautiful woman.” In the wake of such an uplifting and empowering experience, these three determined women decided they would embody their new-found feelings of strength and beauty through female-hero inspired art bras for the 2015 show. And so they did! A 2-year survivor, Olivia is the youngest of 17 children and always wanted to be a fashion designer. Even though she never added that title to her resume, she has always loved to sew and create, so it was a natural decision to create her own bra last year and this year. Olivia explains that the inspiration for her creation came from the role of super hero that most survivors play for their family and friends — putting on a mask while feeling afraid deep down. 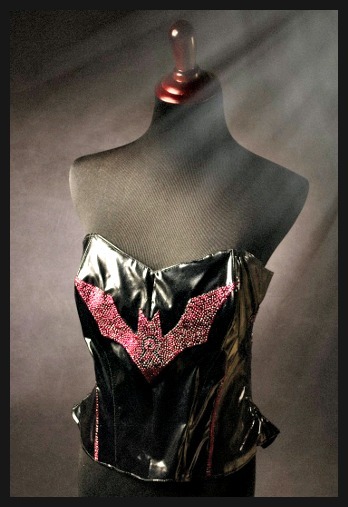 To represent this, she created a black bodice embellished with a pink Dark Knight logo. Olivia’s art bra is in honor of all Pink Ribbon Cowgirls, who will surround you with hope in the middle of a dark night. A 3-year survivor and mother of two, Valerie considers herself a creative and expressive person, and considers it an honor to use her talents for a cause that means so much to her. What started out as creating a bra to honor her mother, also a breast cancer survivor, turned into a project that represented many other breast cancer survivors. For Valerie, Wonder Woman is the ultimate female superhero – a character to whom she often looked to for strength when going through cancer treatment. Valerie’s father even got her a head-to-toe Wonder Woman snuggie, which she proudly wore for every surgery and chemo treatment thereafter. 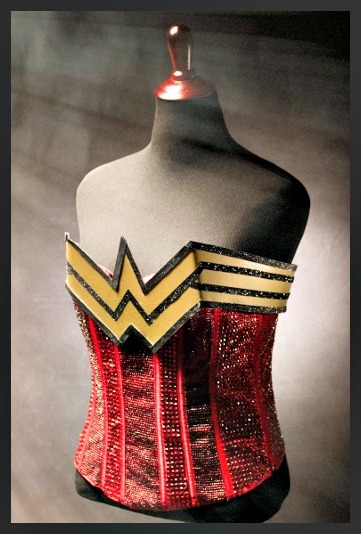 Valerie created her exquisite art bra out of a corset covered in red jewels, adorned with a metal “W” for Wonder Woman, and accompanied by matching arm cuffs and headband to complete the ensemble. It’s not surprising that Valerie was drawn to such a strong image for her Art Bra, as in her spare time, she loves to run races and participate in athletic events. A 2-year survivor, Christin is eclectic and outgoing, and is known for sporting purple hair. Breast cancer runs strong in Christin’s family, so she says she is honored to pick up the banner and fight along with them. 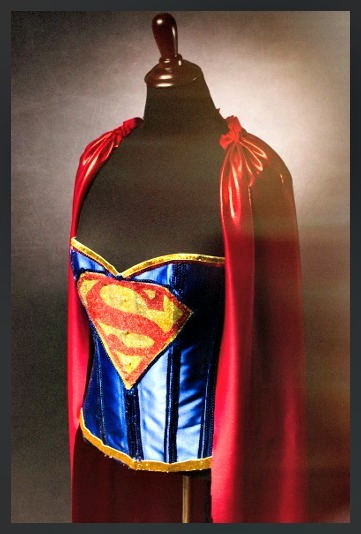 Her superhero costume features a blue satin corset with a glittery “S” inspired by Superman, an attached cape in a red satin and vinyl blend, and matching satin fingerless gloves. Christin created this bra in honor of Melana Monroe and in memory of Laverne Hunt and Janelle Comisky, amazing superhero fighters and survivors. She also created a second Art Bra titled “My Cups Overfloweth,” in memory of Janelle Comisky, a breast cancer sister who loved visiting wineries.